Darline Schmidt, age 92 of Tracy, passed away Tuesday, November 27, 2018 under the care of hospice. Funeral Services were held at 1:00 p.m. Friday, November 30 at Tracy Lutheran Church. Interment was in the Tracy City Cemetery. In lieu of flowers, memorials preferred to Tracy Lutheran Building Fund. Online condolences may be sent at www.stephensfuneralservice.com. Stephens Funeral Service – Tracy Area Funeral Home is assisting the family with arrangements. Darline Schmidt (Ackerman) was born October 16, 1926 to Clarence and Lillie (Johansen) Ackerman in Slayton, Minnesota. Darline worked at the defense plant in Slayton making parts that were shipped off and assembled on Bomber airplanes. She also waitressed in Slayton and Tracy. Darline enjoyed babysitting and assisted many mothers after they had babies. She served lunch on Wednesday mornings for the quilting ladies at church. 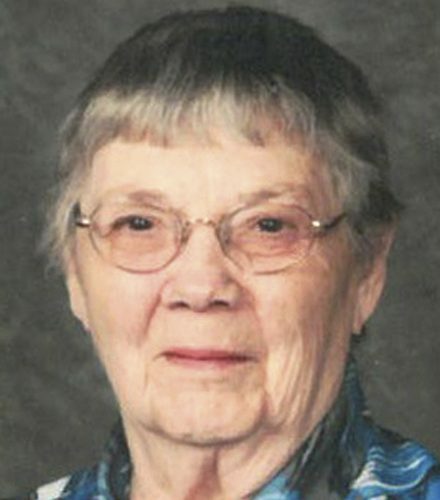 Darline was a member of the Tracy Legion Auxiliary, served on the Tracy Lutheran serving circle and ladies aid committee for years, and a member of the Tracy VFW. She loved playing cards, dancing to old time music, and spending time with her family. She often cooked and cleaned for two hired men besides her husband and 5 children. She worked a huge garden and canned and froze food to last the rest of the year. Darline is survived by her sons: Raymond (Evelyn) Schmidt of Marshall and Roger Schmidt of Tracy; daughters: Ann (Leo) Konz of Adrian, Sharon Schmidt of Savage, Joan (Marlin) Negen of Windom, and Shirley Johnson of Tracy; 11 grandchildren; 20 great grandchildren; 8 great great grandchildren; brother Daniel (Evelyn) Ackerman of Tracy; sisters: Lois (Marv) Ferguson of Lake Wilson, and Diane (Dwight) Smith of Hastings; and sister-in-law Leona “Mrs. Robert” Ackerman of Lake Wilson. She is preceded in death by both of her parents, infant son Donald Severson, brothers Robert and David Ackerman, and sisters Mary Mahon, Betty Bjornebo, and Dora Pommier.